As some of you may know I'm an Eagle Scout, having earned the rank in 2001. As part of my experiences with Boy Scout Troop 1011 in Marietta, GA, I visited the Scouts' major oceanic campsite Sea Base in the Florida Keys twice, once to go sailing and once to go SCUBA diving. 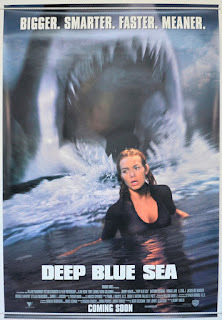 During the first trip, several of my peers and I decided to go see the movie Deep Blue Sea after we got back. I remember really liking it at the time, but how well did it hold up? That's what Myopia: Defend Your Childhood is for. 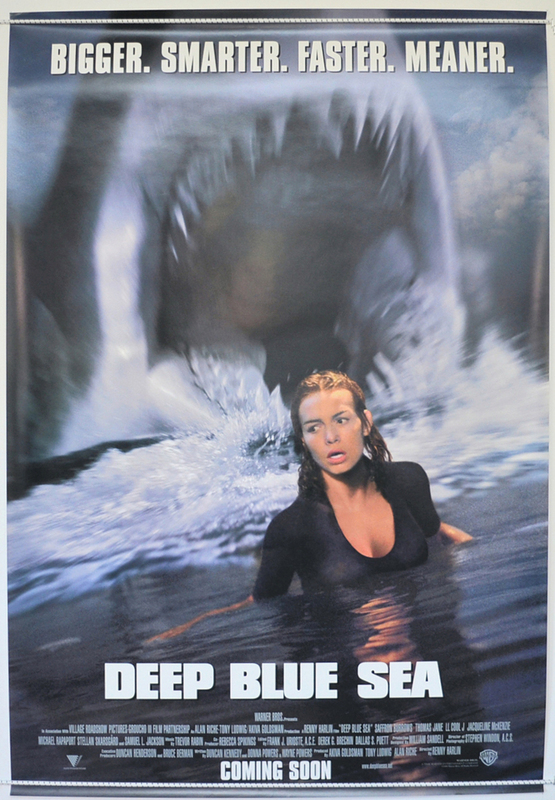 Dr. Susan McAllister (Saffron Burrows), who took care of her Alzheimers-afflicted father during his dying days, presides over a laboratory in which mako sharks with enlarged brains are being bred to harvest for a compound intended to treat degenerative brain disease. After the escape of one shark makes national news, she brings Russell Franklin (Samuel L. Jackson), her chief investor, to her oceanic lab in a bid to prevent it from being shut down. There he meets other members of the staff, like parolee "shark wrangler" Carter (Thomas Jane) and "Preach" (L.L. Cool J), a former clergyman who's now the facility's cook. *The concept is pretty interesting. In shark attack movies, the default "bad shark" is almost always a great white simply due to the being the biggest overtly-predacious sharks (the larger basking shark and whale shark feed on plankton and krill). I think there was at least one horror movie depicting a tiger shark as the villain and the upcoming sequel depicts bull sharks (which are much more likely to be aggressive toward humans) as the villains, but other than this movie, I have never heard of mako sharks being movie monsters before. *This being a monster movie, there are some pretty creative kill scenes. I'm not going to go into a lot of detail to avoid spoilers, but one involves a gurney and the other involves a character being torn in half. *There's some decent acting, especially from Samuel L. Jackson. Burrows does a decent job with McAllister's intensity, although I would have expected more emotion from her when recounting her father's last days. *The only real villains in the film are the sharks, and they're just animals acting according to their nature rather than being truly malicious. It's true that McAllister's poor judgement and excessive zeal caused the problem in the first place, but given the back-story where she had to care for her dying father, that she'd be so monomaniacal in pursuit of her goal of curing degenerative brain disease makes a lot of sense. She's not evil or malicious. *The sharks in this film's greatest danger isn't their destructive physical power, although there's plenty of that, but their intelligence. They're dangerous smart creatures and put our heroes in jeopardy quite a bit. Seriously, given some of the things they pull off in the movie, one could make an argument that these sharks are smarter than humans. *This is something I got some pushback on from other members of the podcast, but I liked the depiction of Preach as a Christian character. He's not a preening holier-than-thou jerk, a domineering authoritarian fundamentalist (think Escape from L.A. ), or a hypocrite loudly condemning some sin that he secretly practices. Nor is he unrealistically perfect. He has a drinking problem (cooking sherry!) and admits having failed as a preacher, a husband, and a father, but when things go down, he's the one who keeps it together and even leads other characters in prayer. At one point he compares his own situation to Daniel being thrown into the lion's den. *I liked the brief interplay between Preach and Russell. I've taken a class on portrayals of different ethnicities in movies and they riff on the "black guy dies first" trope that comes up quite a lot. *The CGI used to create the sharks has not aged well since 1999. Although I said on the podcast that this is something to be expected, the more I think about it the less valid an excuse that is. Jurassic Park , which came out several years earlier, had vastly superior CGI, as did Men in Black . It might've been better to use more practical effects, or Jaws -style "don't see much of the sharks until the end" to get around this, especially if the poor CGI was a consequence of its budget rather than incompetence. *The middle part of the film kind of drags. *There's a scene involving McAllister needing to get out of her wetsuit that is pretty ridiculous fan-service. *Although I liked Preach, there is a little too religious anti-science for my taste. Preach at times becomes convinced the shark is a straight-up demon (i.e. a supernatural evil entity) and Carter criticizes McAllister for giving God's greatest killing machine "will and desire." Pursuant to my next point, McAllister's only straight-up sin I can think of was dishonesty about just what she was doing with the sharks. Bad judgement, even the kind that deserves legal sanction (I'm thinking there'd be a lot of charges of reckless endangerment in her future, and since several people died, not just due to the super-sharks existing, but due to her actions when one of them attacks a scientist, probably involuntary manslaughter too) doesn't equal immorality. And moralizing about "playing God" aside, I am not aware of any strong religious justification for opposing genetic engineering, cloning, etc. *Per the above, there are strong anti-intellectual and Science Is Bad vibes in this movie, as TVTropes would put it. Again, although McAllister wasn't being honest about what she was doing to the sharks, it took a series of unlikely events for the sharks successfully break into the facility and start hunting the people. Even though McAllister prevented a shark that had attacked another scientist from being killed (which Nick pointed out was Not A Good Thing), it took a problem with the helicopter nobody could have foreseen for the next events to happen. Yet when things go wrong, it's the "street smart" but less-educated characters like ex-con Carter and the facility's cook Preach who are more effective than the scientists, especially Janice (Jacqueline McKenzie). Yes, many people are book smart and lack good judgement and common sense or are prone to panicking, but still. *To that end, one could also argue that the way "book smart" and "street smart" break down, the female characters end up portrayed worse than the men. Janice is panicky and hysterical and it was McAllister's poor judgement that caused the whole situation in the first place. Meanwhile, Carter and Preach are the ones who save the day. I am NOT accusing anybody of deliberate bigotry, sexism, etc. but that's still the vibe I got. Another one of those "see it once" films. 6.5 out of 10. There is a sequel coming out this year, which seems to go even further into the "man was not meant to play God" mentality than this one and looks like a bad-CGI direct-to-video schlocker on top of that. I don't think I'll be seeing it.